PRATT ­– The first annual Kansas Birding Big Year, which began last April, came to an end Dec. 31, 2013. Fifty-four participants signed up for the inaugural competition. First place winner in the adult division, James Malcom of Topeka, spotted and identified 319 bird species, setting quite the benchmark for future competitors. There are three age categories: youth (18 and under), adult (18-64), and senior (65 and older), with most participants entering the adult age category. 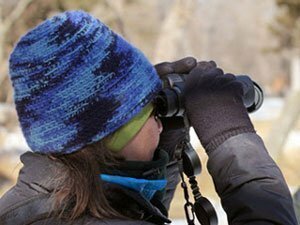 Designed to get more folks outdoors and watching birds, the Kansas Birding Big Year competition came about after Kansas Department of Wildlife, Parks and Tourism Secretary Robin Jennison saw the popular movie “The Big Year,” depicting avid bird watchers trying to see as many species as they could in a single calendar year. Secretary Jennison thought it would be a fun and interesting way to get Kansans interested in bird watching, so the competition took flight and continues to gain altitude and popularity as we soar into it’s second year. Prizes were provided courtesy of sponsors, including Cabela’s, Bonner Springs, Bass Pro Shops, Olathe,Walmart, Pratt, Bushnell Optics, Overland Park, JanSport, Alameda, Calif., and Acorn Naturalists of Tustin, Calif. In addition to receiving prizes, winners from each age group will also receive an original matted and framed pencil drawing of a native Kansas bird species, drawn and donated by Dr. Robert Penner of Ellinwood. Penner is the land steward for the Nature Conservancy at Cheyenne Bottoms and also serves as the Avian Projects Coordinator for Kansas. Although the 2014 competition began Jan. 1, there is still plenty of time to sign up and participate; simply visit ksoutdoors.com and click “Services,” “Education,” then “Birding Big Year Competition” and start recording.